In support of our military and man's best friend, Guardians of Rescue will host an exciting car show, fundraising and pet adoption event this Saturday, June 22nd. 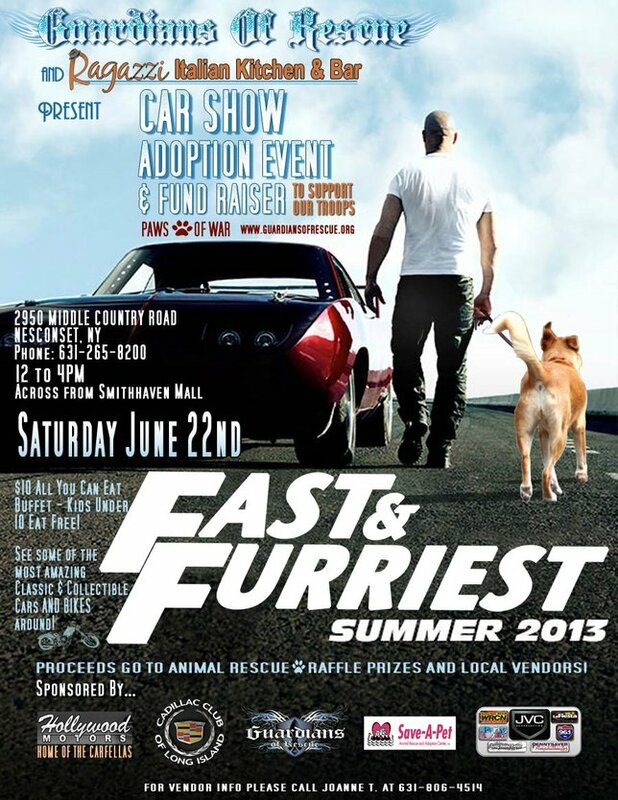 Smithtown, NY - June 19, 2013 - In support of our military and man's best friend, Guardians of Rescue will host an exciting car show, fundraising and pet adoption event this Saturday, June 22nd at Ragazzi's Italian Kitchen & Bar located at 2950 Middle Country Road in Nesconset, NY from 12-4 p.m. All proceeds from the event will support Guardians of Rescue's Paws of War Program, which help veterans suffering from PTSD (post-traumatic-stress-disorder), by pairing them up with a rescued and trained shelter dog. After being designated an official diagnosis in 2010, PTSD affects many returning soldiers serving in combat zones, and therapy dogs have been credited with aiding the healing process the vets must go through to overcome this illness. From drawing out the introverted personality often associated with PTSD, to creating emotional outlets that can then transfer to personal relationships, these dogs are of great importance to the wounded vet, physically and mentally. "Our Paws of War program has been proven successful time and time again in helping our service men and woman return to their normal lives," said Robert Misseri, founder and President of Guardians of Rescue, a non-profit organization based in New York whose mission is to protect the well-being of all animals. Fun for the entire family, the event will feature local vendors, raffle prizes, delicious food, and some of the most amazing, beautiful classic & collectible show cars and motorcycles found anywhere. Guardians of Rescue will also have animals available for adoption. Admission is $10, and all proceeds benefit Paws of War. Guardians of Rescue provides assistance to animals out on the streets, helping to rescue them, provide medical care and find foster placement. Their "Paws of War" program helps active military find foster homes and care for their pets while overseas and provides support to veterans suffering from PTSD by the use of therapy dogs. For more information about the event or to make a donation, visit www.guardiansofrescue.org. Based in New York, Guardians of Rescue is an organization whose mission is to protect the well-being of all animals. They provide aid to animals in distress, including facilitating foster programs, rehabilitation, assisting other rescue groups, and providing support to families, both military and not, who need assistance due to economic factors. To learn more about Guardians of Rescue, visit the site at www.guardiansofrescue.org or on Facebook. Apply SAP support packs in systems! Subject: LongIsland.com - Your Name sent you Article details of "Guardians of Rescue Hosts Car Show, Fundraising and Adoption Event to Support Veterans Suffering from Post-Traumatic-Stress-Disorder"